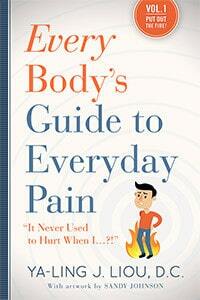 Book Review: Every Body’s Guide to Everyday Pain, by Ya-Ling J. Liou. D.C. Pain is a vexing condition. But when it’s sudden and sharp, it has the added element of an unpleasant surprise. While the source may seem mystifying, as Dr. Ya-Ling Liou explains in her book, Every Body’s Guide to Everyday Pain, pain is often the end result of a whole range of stressors. You twist this way, or move that way, and suddenly you’re in agony, but it’s been building all the time. Dr. Ya-Ling Liou’s useful guide maps out the nature and causes of pain clearly and with empathy: two decades of helping patients has been parlayed into a practical and reassuring approach. Knowing your body is key, says this long-time practitioner of chiropractic medicine, as all manner of imbalances, from mechanical and chemical to emotional, can contribute to discomfort. She offers a helpful perspective on the nature of inflammation, clarifying that it’s not the “aid vehicles,” as she calls our cellular relief-and-repair response, that the body has problems with, but how to circulate them out fast enough for a new crew to show up. That’s why the simple method of applying ice and heat works: the hot/cold intervals trigger the blood vessels to contact and expand, and that, in turn, improves circulation and flow. Pain is debilitating, to be sure, but the more we know, notes Dr. Liou, the better we can handle it. She writes about the brain’s ability to become hard-wired to endure pain and carry on regardless — but points out that such endurance is only supposed to go on for short periods of time. (And that’s one reason chronic pain can be so exhausting.) Instead of trying to ignore our pain, we need to learn how to better deal with it. If we view it as a window into our body; an apt indication that something is wrong; we may in fact make ourselves better. Dehydration, sleep deprivation, repetitive motions, poor diet, stress — all can trigger pain, and all are conditions that need to be alleviated in and of themselves. In Every Body’s Guide to Everyday Pain, Dr. Liou not only addresses what to do to alleviate pain, but how to keep it from coming back. With stress, she writes, it may be as simple as going for a walk in the woods, and getting a healthy dose of “moving meditation.” It doesn’t necessarily take bottles of pain relievers to relieve pain, as it turns out, just the willingness to listen to our own body.